—Michele Drier, author of Edited for Death and The Kandesky Vampire Chronicles. 5 Stars: “This mystery kept my attention from beginning to end. Although I had my suspicions of one character, the solution to the mystery surprised me. And that, my friends, is the mark of a good mystery.” Read more …. “A smooth running story where slowly pieces of the puzzle are revealed. Being a book lover I liked the setting she created with the book club …. The author manages to reel the reader in with her delightful storytelling and likable characters. It’s a great first book that lovers of the old-fashioned detective genre surely will appreciate!” Read more …. “A satisfying, clean mystery with several twists that kept me guessing, and also left me anxious for the next book in the Hollis Morgan Mystery series.” Read more …. “This first book written by Ms. James is a winner for anyone who enjoys a clean mystery which will keep you guessing until the end about ‘whodunit.’” Read more …. “A fast paced mystery that keeps the reader wanting more. I loved a good mystery and this is one of the better ones I have read in awhile. A fun story for sure!! !” Read more …. “The story line was interesting, as were the characters. The book flows steady without any dull gaps. I really liked the authors way of writing…. If you love a good murder mystery, you should get a copy of this book.” Read more …. “Kept me guessing from the beginning. A must-read for all mystery fans.” Read more …. “Hollis is a character you sorta warm up to, you have to get past her cool exterior and suddenly you realize you REALLY like her and care what happens to her. I ended up finishing the book in one sitting! Although the book is set in the Bay Area outside San Francisco, the author serves up the area as a backdrop, but then concentrates on the characters. The place never intrudes on the story line, like it can in some books. The author does an excellent job of building up the different characters, so that you feel like you know them all. I was happy with the ending (and no I’m not giving it away!) and I’m thrilled there is already another Hollis book in the making!” Read more …. “The book moves along at a fast pace and Hollis finds herself wrapped up in a couple of different mysteries. I started to have my suspicions about people, but hadn’t quite wrapped it all up when the author started to spill the beans about how everything fit together. I was quite surprised by some of the things I found out in the end, about someone who was close to Hollis. It was a nice surprise.” Read more …. “This is R. Franklin James’ debut novel, a fact which I find hard to believe. She has created a character I love in Hollis Morgan, and a great plot …. I’m going to follow the series and R. Franklin James. I’ve found a winner.” Read more …. The Fallen Angels Book Club has only two requirements: the members must love books and have a white-collar criminal record. Hollis Morgan fits the bill. Left holding the bag in an insurance fraud scheme concocted by her now ex-husband, she served her time and is trying to rebuild her life. All she wants is for the court to pardon her conviction so she can return to law school. After one of her fellow members is murdered in a scenario straight out of a club selection, Hollis is once again the subject of police scrutiny. Refusing to get stuck with another bad rap, she sets out to investigate her fellow club members. Is one of them really blackmailing the others? As a second member dies in yet another book-inspired murder, Hollis realizes that time is running out. Everything rides on her finding the killer—not just her career aspirations. She must identify the killer before she herself becomes the next victim. Everyone is convinced she knows more than she lets on. But what is it, exactly, that is she supposed to know? Says James, “My inspiration for the Hollis Morgan character originated with an online writing class. My fellow class members came from all over the world, from a variety of backgrounds and they included one sociopath. Only we didn’t know that until members started receiving email threats. Our instructor dropped him (or her) from the list, but I couldn’t shake the idea of a group of people coming together to share their art, only to be stalked or hounded by a greedy opportunist. I gave my group a secret—their criminal past—and the Fallen Angels were born. R. Franklin James grew up in the San Francisco East Bay Area and graduated from the University of California at Berkeley. She and her husband currently live in northern California. 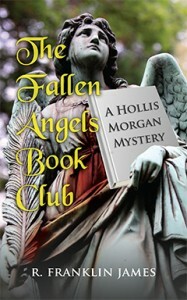 The Fallen Angels Book Club is her first novel and the first book in the Hollis Morgan Mystery series. Click here to find R. Franklin on the Web. I looked through the peephole and froze. “Who is it?” I said, hoping to buy myself a couple of seconds. “Ms. Morgan? It’s Detective Faber. I’m with Detective Lincoln. Can we speak to you for a few minutes?” His voice sounded loud and clear, even through the door. They looked around with curiosity as if they’d never been here before. I guided them once more into the living room. I didn’t sit because I didn’t want them to. We all stood around the coffee table. Rebecca Hollis Morgan Lynley was my unlucky name. It was the name that brought shame to me, my family and my friends. It was the name I was known by when I served time in prison. It was the name I acquired when I married that jerk. Rebecca Hollis Morgan Lynley. It was a name I never wanted to hear again, but here it was, turning up like a bad penny. For one insane moment, I wondered what was behind that bad penny saying. I knew how that penny felt. Lincoln seemed to come to life. “I wondered if you checked the felon box on your job application.” His expression told me that he expected I had lied. So that was it; he liked pulling wings off butterflies. He wanted me to squirm. At that I had to sit. They followed suit. Lincoln leaned over and picked a foil-wrapped chocolate out of the glass candy dish on the table. I tried to remember how long the candy had been there. One of the prison staff had given me a small box as a good luck gift. Could people die from eating candy three years past the “best by” date? He popped it in without noticing the thin whitish coating and grabbed for another. “You didn’t know Norris was a blackmailer?” Faber asked. “That’s right. How did they know each other?” Faber asked. “Bill and Rory knew each other?” The words left my lips but sounded far away. Let’s try to maintain some integrity here. I couldn’t tell if they believed me. They asked a few more questions about the club and then left with the promise to get back to me if they thought of anything else. Based on my last law enforcement encounter, I had a feeling their next step would be to obtain a search warrant. I tossed the salad down the disposal and went out on the deck with my wine. I’d lost my appetite. The opposite of love isn’t hatred, it’s indifference. I was working on it, not every day, but as often as my sanity allowed. I was glad to feel almost nothing. Nighttime was always the worst for me. Insomnia had become my companion. At night, I’d close my eyes, and the noises and smells from prison would assail me. A few months ago there was a special on TV about women in prison. I couldn’t watch it. Even though my cell was behind a door and not bars, I heard my fellow inmates crying and praying. It went on for hours on end. I could neither cry nor pray now. I had to get a pardon. I’d do whatever it took. Rory’s unsolved murder could threaten my future dreams. I had to have another chance.